Please join us for a kick-off reception at Fayetteville Underground on Saturday, Feb. 15th 5-7pm. Project representatives and previous artists will be available to answer questions about UpStream Art and show off the previous years’ art. What are we looking for? There are 12 storm drains identified for the 2014 project. A committee of city staff, local artists, and representatives from the art community will select designs from those submitted. Each art piece will be approved by the appropriate mayor. Keep in mind the messages we are trying to convey as you create your design – that storm drains lead to creeks and streams. We are asking all designs to have the message “Drains to Creek” in English or Spanish somewhere in the art. If the message is not included in the art, the words will be stenciled next to art. We will also have a 3”x3” vinyl QR Code that can either be incorporated into the design or will be placed next to the art. The code can be used by mobile devices to link directly to this website. You may tailor your design based on a specific location or choose to do a more general design that could apply to any storm drain. If you are tailoring your design, please remember to mark that on the application. Art Parameters – Each artist is challenged with incorporating the physical storm drain structures into their art piece. The general size of storm drains are 4’x6’, but this will fluctuate with each drain. All artwork should remain within the confines of the storm drain structure. This is the concrete that immediately surrounds the opening (or throat) of the storm drain and the concrete box around the lid. 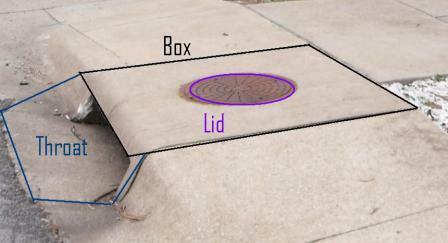 The lid is the metal manhole cover that is used for municipal drain access. The lids may not all have the same placement within the structure or the same design into the metal. The cities have allowed access to artist to paint the throat of the drain (which may allow a three dimensional component) but the art can not extend into the street. It is strongly encouraged that each artist visit the site of the storm drains before designing their art. *If you want your art to be considered for the 2014 Fayetteville Underground Gallery show, you must have installations completed by April 20th!! !